This project is focused on the development of a new approach to imaging that significantly enhances the dynamic range of an imaging system. The key idea is to adapt the exposure of each pixel on the detector based on the radiance value of the corresponding scene point. This adaptation is done in optical domain, that is, during image formation. In practice, this is achieved using a two-dimensional spatial light modulator, whose transmittance function can be varied with high resolution over space and time. A real-time control algorithm has been developed that uses a captured image to compute the optimal transmittance function for the spatial modulator. The captured image and the corresponding transmittance function are used to compute a very high dynamic range image that is linear in scene radiance. Extensive simulations and experiments have been conducted to demonstrate this concept of adaptive dynamic range imaging. The simulation results show the ability of the control algorithm to produce stable, high quality images even when the scene changes with time. We have implemented a video-rate adaptive dynamic range (ADR) camera that consists of a color CCD detector and a controllable liquid crystal light modulator. Experiments have been conducted in a variety of scenarios with complex and harsh lighting conditions. The results indicate that adaptive imaging can impact vision applications such as monitoring, tracking, recognition and navigation. 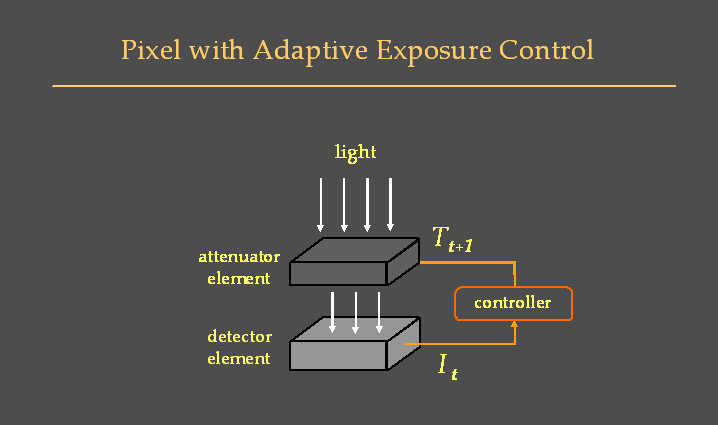 The exposure of a pixel can be made to adapt to scene radiance by using an optical attenuator whose transmittance is computed based on the brightness measured by the pixel. One of the various methods for implementing adaptive dynamic range (ADR) imaging. 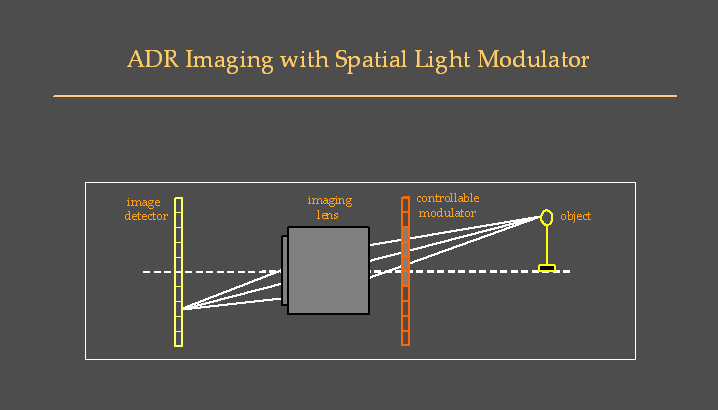 A controllable spatial light modulator is placed in front of, and close to, the imaging lens of the camera. A real-time control algorithm is used to modify the modulation function of the light modulator based on each captured image. 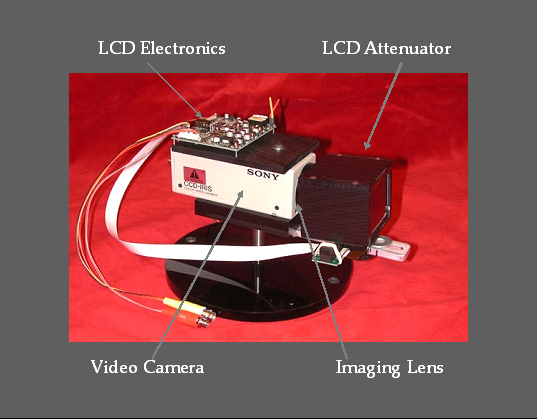 A prototype implementation of the ADR camera consisting of a color video camera, an imaging lens, an LCD spatial attenuator and electronics to control the attenuator. This video shows the ADR camera working in various real-world settings that have harsh lighting conditions.